Google has announced that it is not just books that it is digitising, but magazines too. The search giant has revealed that it has started to digitally archive more than 1 million articles from a variety of magazines that are now available to be viewed online. Instead of taking content from current newsstand mags, the company has trawled through archives more than a decade old to find the features. So far 'dozens' of magazine publishers have agreed to let Google index their archived content. The magazines being archived include: New York magazine, Maximum PC, Jet and Best Life. This new indexing campaign is part of a much bigger content collation process that has seen Google digitise out-of-print books and Life magazine allow the search engine access to its extensive photo collection. 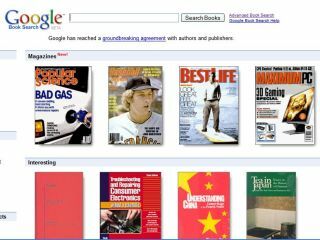 To find the magazine articles, you have to go to the Books section of Google, and then choose Magazines.